248 big square pages of delight! Color strips reproduced in… color! Have an extra exclamation point! All of the Surreality, Inc. strips that ran on the site! The full guest appearance of the Eastons on Woody After Hours! ”The Proposal” story in its original intended format! Fantastic fan art and guest comics! To make your copy of the book extra special, order an Artist Edition, and I’ll add an original sketch to the inside cover of the book! (Please specify in the text box provided if you have a favorite character, or if you'd like the book made out to someone in particular). 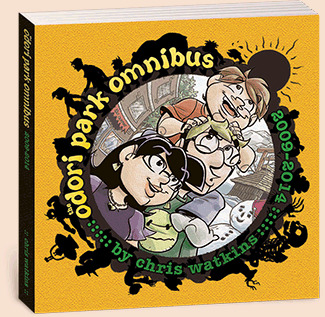 96 pages of Odori Park goodness! A forward by Brock Heasley of The SuperFogeys! 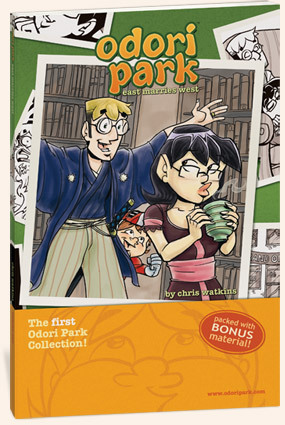 The first Odori Park--a 24-page 24-hour comic! A behind the scenes look at creating the comic! The visual development of the Eastons! A comic collaboration with my four year-old son! Bonus artwork, sketches, and anecdotes! Fewer exclamation points than seen in this list! If that's not enough, please consider an Artist Edition. Each Artist Edition includes an original sketch from the Odori Park-iverse. (Specify in the text box below if you have a favorite character, or if you'd like the book made out to someone in particular).